How long has it been since you last donned 3-D glasses? Almost 20 years? 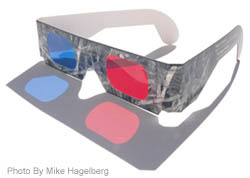 Well, a free dance concert, "Paper Interiors," will put you back in those funky glasses with the red and blue "lenses." The concert is part of the Southwest Region American College Dance Festival that ASU is hosting. Biologist Charles Kazilek and English instructor Gene Valentine produced the images that provide the backdrop, while designers Jacqueline Benard and Galina Mihaleva, costume shop coordinators for the Department of Dance, used large-format printing technology to transfer paper fiber images directly onto the dancers' garments. The Southwest Regional American College Dance Festival comes to Arizona State University next weekend. Two events are open to the public: a gala performance at Galvin Playhouse and performances of a dance work, Paper Interiors. The work was created by ASU dance faculty member Jennifer Tsukayama, ASU biologist Charles Kazilek, English department member and papermaker Gene Valentine and Sheila Britton, who works in ASU's Institute for Studies in the Arts. It was Kazilek's images of Valentine's handmade papers that inspired the dance. They now provide its backdrop. Valentine made paper of fibers such as cattails, yucca, agave, silk and wasp nests. Kazilek photographed them, using a scanning laser "confocal" microscope in an ASU lab. Audiences will see the images by using 3-D glasses, which trans form flat images into three dimensions. Britton's job was to re-create the images in large format so dancers could move within the fibers interactively. ASU costume designers Jacqueline Benard and Galina Mihaleva added to the interactive sensation by working with printing technologies to imprint the images "directly onto the dancers' nylon and span dex garments" so that "the division between human and environment is no longer distinct. Ultimately, the dancers are swallowed into the paper, and the two are symbiotic," Tsukayama said. A "no-text" sound score, Tsukayama said, will be created by Evelyn Glennie, Martha Mooke, Temple of Sound & Rizwan-Muazzam Qawwali, and Majoun. She said the 25minute multimedia/dance experience is "a glimpse into the microcosm of paper fibers. It's like traveling to another galaxy. I try and bring a world the size of a 'period-dot' to a life-size scale and then beyond." Paper Interiors will be performed free at 1:30 and 7:30 p.m. Thursday and next Friday at ASU's Drama City, University Drive and Myrtle Avenue, Tempe. 3-D glasses will be provided. The gala performance will be 2 p.m. March 16 at Galvin Playhouse, Mill Avenue and 10th Street in Tempe. Tickets are $5 and $14 at (480) 9656447. To view some of the 3-D images of microscopic paper fibers used in Paper Interiors, visit the Web gallery at http:/lifesciences.asu.edu/paperproject. Paper Interiors by Institute for Studies in the Arts: 1:30 and 7:30 p.m. Thursday and next Fri day, ASU's Drama City at Galvin Playhouse, 51 E. 10th St., Tempe. Part of the American College Dance Festival, hosted this spring by the Department of Dance. Here, 3-D glasses offer the audience a fusion of real and virtual dimensions as dancers move within projected 3-D images of microscopic paper fibers. A collaboration between the Institute for Studies in the Arts, and the departments of Biology, Dance and English. (480) 965-7144.